I started this blog post as a social media post and very quickly worked out that this topic deserves a longer discussion than just a few sentences thrown out into social media space. Slow Fashion for us is an extension of the Slow Food movement and is part of the reason we love living where we do, the Central West of NSW. This area is known as a "food basket" and is very aptly named with volcanic soils it is perfect for growing food. We love to buy our food as locally as possible and know who grew it whenever possible. For example we buy our fruit from our neighbour, our orange juice comes from Narromine, meat from our own property and our local butcher that has their own farms and our dairy products from The Little Big Dairy in Dubbo. It's part of what makes our community circle. We find community isn't just limited to a geographical area but more about the people and businesses you know and understand. It is not always possible to be able to make these choices or even have the information to make these choices but I am a firm believer that in making small choices wherever you can it can make a difference. Extending these choices from Slow Food to Slow Fashion becomes even more difficult as so much of our manufacturing is now done overseas. Slow fashion, the alternative to fast fashion and part of what has been called the "slow movement", advocates for principles similar to the principles of slow food, such as good quality, clean environment, and fairness for both consumers and producers. 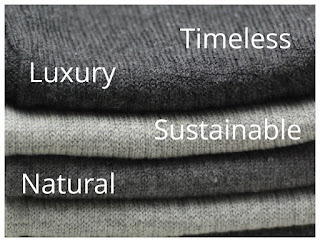 Fairness for both consumers and producers is a very important part of Slow Fashion. 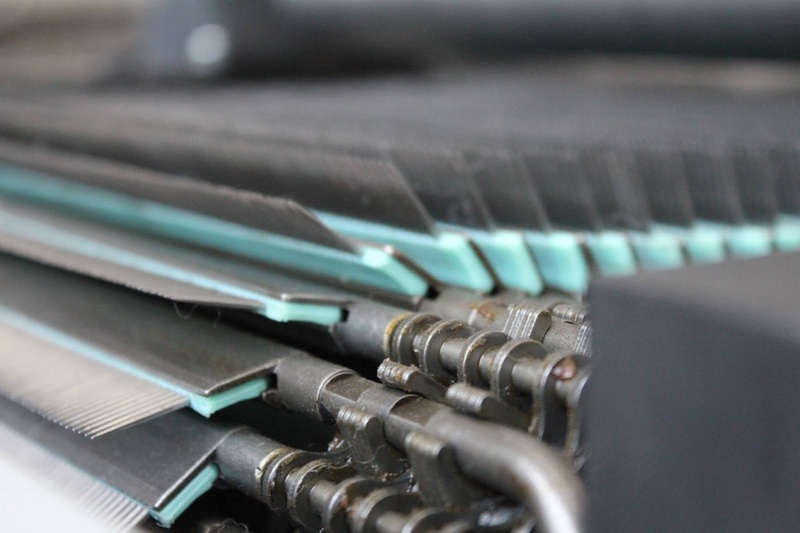 It touches on an overall responsibility for the whole process of manufacturing clothes. In fairness it needs to include suitable conditions for workers and the overall supply chain for the products, including the growers of the raw fibres. It needs to acknowledge that cost is a driving factor and that to survive the producer needs to be able to make a margin but I think it also includes a responsibility of the manufacturer to not undertake activities that the consumer would object to, such as polluting the environment or endangering team members. Transparency is not always able to be achieved but all consumers would object to buying something that takes advantage of people, damaged waterways or poisoned fish or animals. This is not to say that all manufacturing overseas does this but that we have lost the transparency and therefore also the accountability. Sometimes it is all too easy to buy the multiples of cheap items available to us today and be so removed from the process that these factors are no longer real to us. We forget that it is the consumer that will drive the behavior of the producers. For so long cost has been the primary driving factor in purchase decisions for the vast majority of consumers so is it no wonder that the producers have found ways to give us what we are asking for? Australia can be proud that it has comparatively high labour rates however that makes it very difficult to run a manufacturing business. So when we are choosing to buy our "stuff" whether it be food, clothing, toys or otherwise we need to seriously consider buying something made ethically as well as something which will last. Or one day we will wake up and there will be nothing left being manufactured or grown here, rubbish tips will be full of disposed items and wonder why there are no more jobs (other than rehabilitation of tips) and a deteriorating community? The reality even for us is that we have 3 small children, many costs in starting a new business and the same living costs as everyone else. So making ethical choices is hard. And is it not always clear what the ethical choice is. I can't always buy from companies that I can trace their sources or even when I can trace I may not be able to afford their products but I strongly believe that the choices I do make will make a difference. In addition to the small everyday choices that we make, we also made a very big choice. 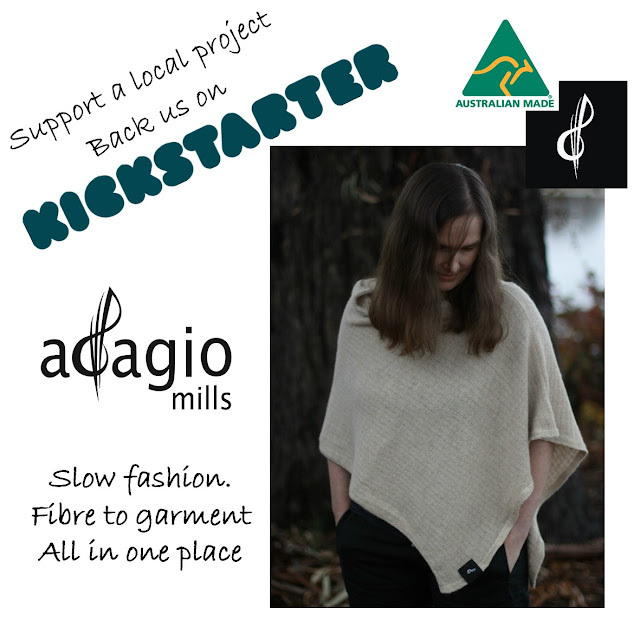 We started Adagio Mills. We can not describe how difficult this road has been. Until we lived this choice, whilst we knew about the difficulties and constraints on running a manufacturing business in Australia, it wasn't completely "real" to us. Paying our staff appropriately as well as all the other requirements such as super and worker's compensation is more difficult than we could have ever imagined. 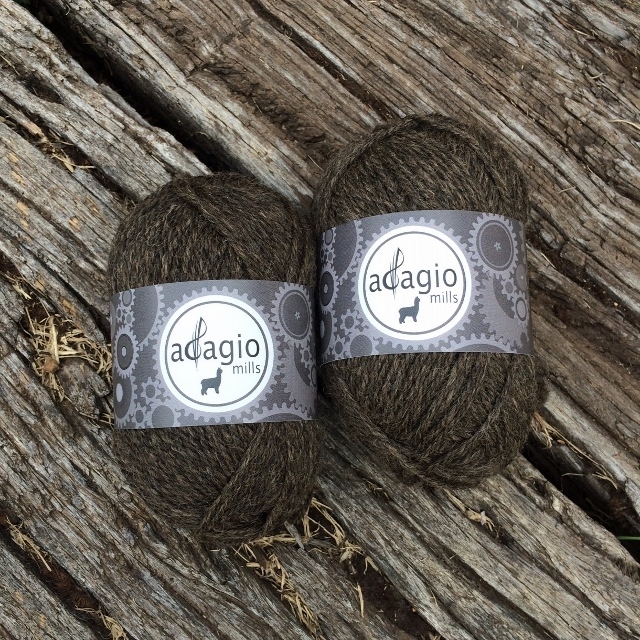 Adagio Mills at the moment makes knitting yarn from natural fibres. 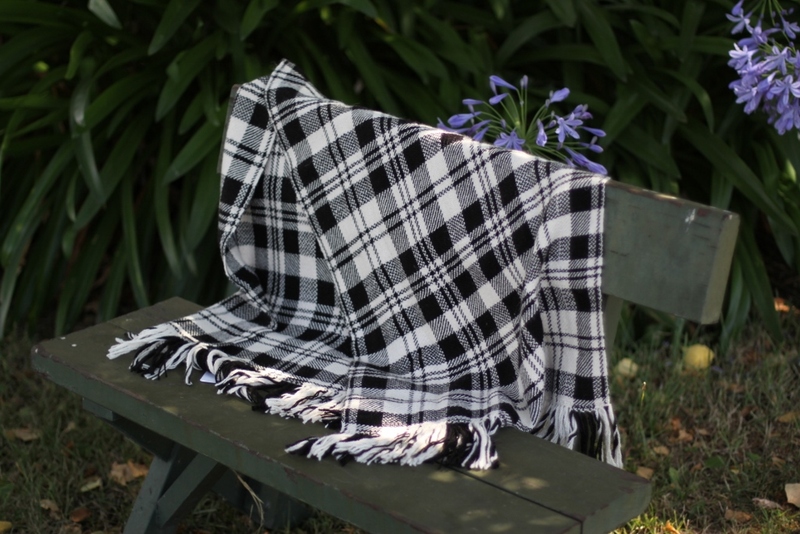 We provide local, regional employment and are as environmentally friendly as we can be, even choosing to use the timeless qualities of the natural colours of the fibres instead of using dyes. We are regularly out and about in the community promoting this business and so many people come past us and give us a fantastic pat on the back. "We love what you do" they say or "We need more people like you" they say. Then walk away without buying anything. Not even a token ball of yarn to give as a present to someone. This is devastating to a business like ours. As much as we like the compliment and the words of support, we can't just pay our team compliments. We have started our second crowdfunding campaign to generate interest and presales of garments to help us obtain a knitting machine. We hope that this will help us to expand our market and help us to be here for the future. If you would like to find our more about it there is more information at this link, we definitely need your help. So even if what we do doesn't necessarily appeal to you, please in your everyday choices, consider Slow Fashion and Slow Food. Make the small choices (or the large ones) that make a difference to farmers and other businesses local to you and help keep the community together. 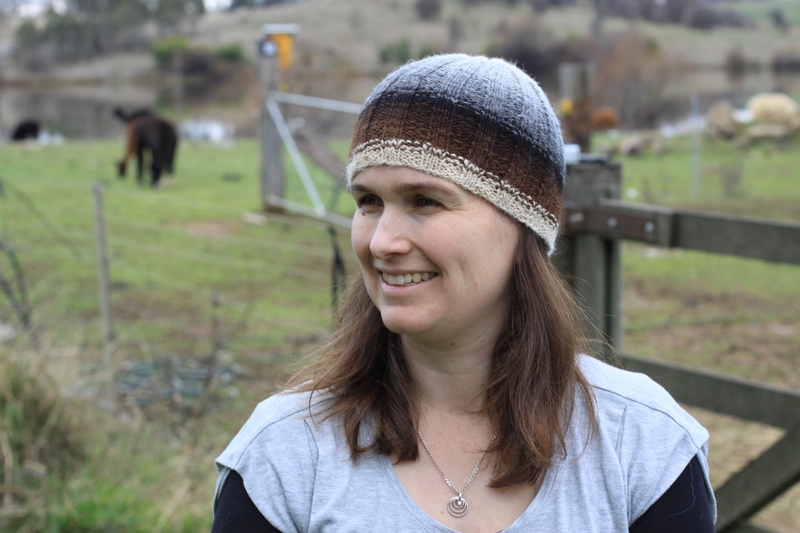 Everywhere we go we find people love what we do and our yarns, but many would like to buy our knitting projects as finished garments rather than knit them themselves. 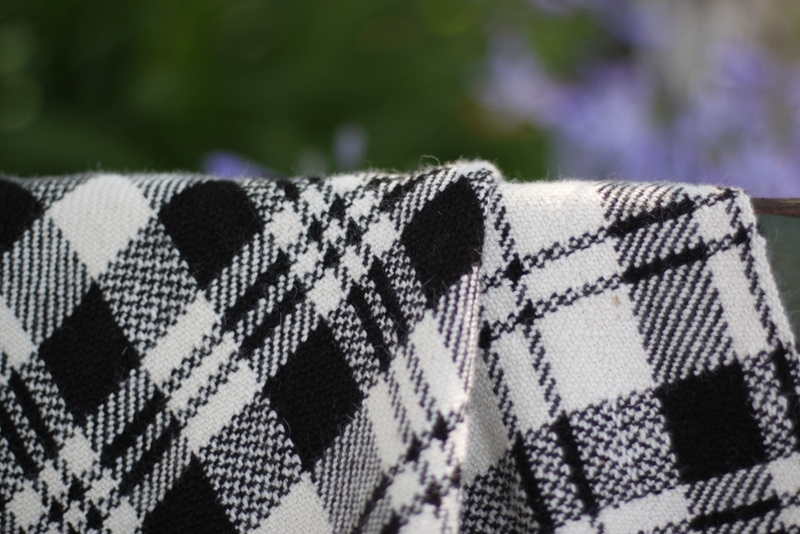 So we have identified and tested a knitting machine that matches our yarns and are very excited that we could be one of the few mills that are able to process all the way from fibre through to finished garments in one place. Why crowdfunding? You may have noticed, or even been involved in, the Kickstarter campaign that we ran in 2015. We were backed by 200 backers and were successfully funded. We have a lasting connection with our backers who have started the Adagio community. We love meeting our Kickstarter backers in person when we have been out promoting Adagio Mills and have loved to see what they made with their yarn rewards. Become a backer and we will share with you the development of your garment from fleece through the whole process until it is ready to wear. 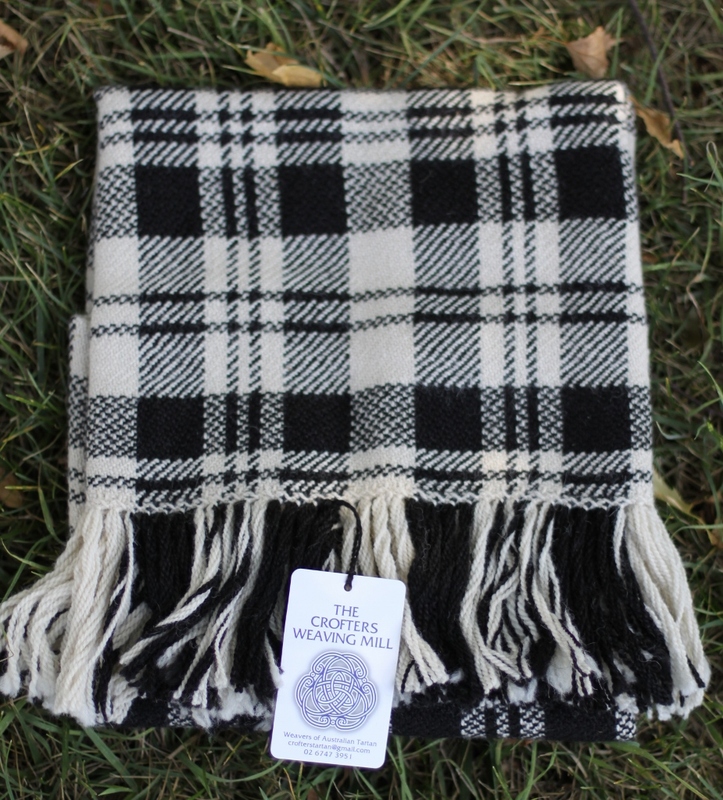 From the start we will bring you closer to the farmers who grew the fleece then learn about how we make yarns. We will be developing a special blend of merino and alpaca fleece into a superior yarn to make your garment extra soft and cosy. 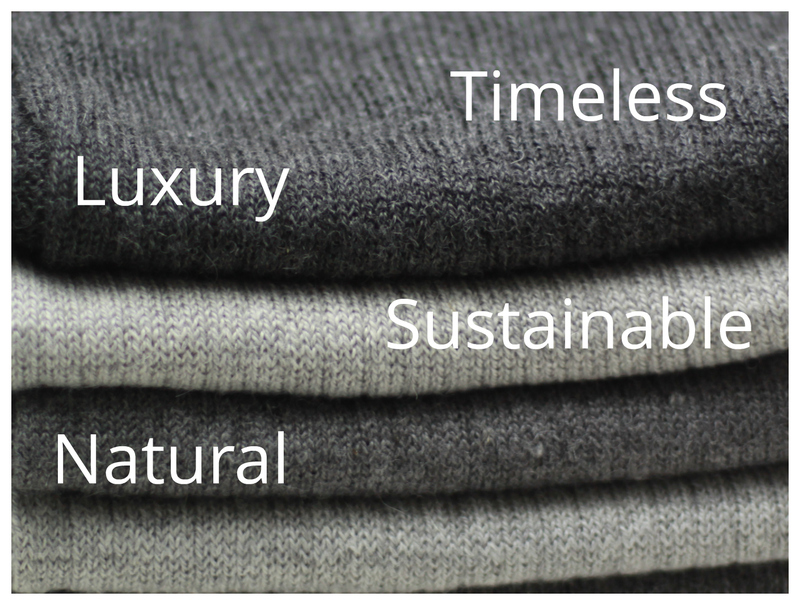 You will receive exclusive insights on the development of this yarn and its processing through our mill. This will include videos and images of the processing of the yarn. The journey will then continue with the ups and down of installing and learning to operate our new knitting machine and knitting your rewards. 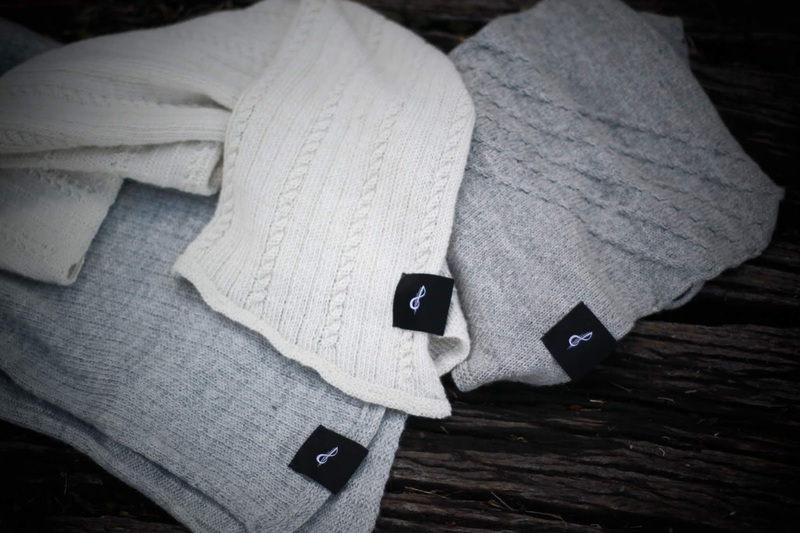 Be the very first to receive products made from our knitting machine, the "First Edition". 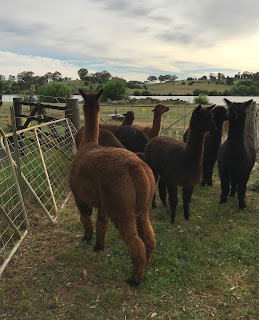 Shearing time and tips for small or first time breeders or owners of alpacas! Waiting their turn for shearing. Like many small breeders or owners of alpacas in Australia it is shearing time! Its been rather warm here so I'm very pleased that they are now shorn as they will be much more comfortable. Watching alpacas interact before and after shearing is so interesting. How much fleece they grow seems to affect their status in the group and their own identity. After they are shorn they almost look bashful like they are wandering around with no clothes on! They also all have to re-greet everyone to figure out who is who as they all look different. I love how tiny they really are under their fleece! Here are some photos of our shearing session today. Woohoo we are free! Tux has even rolled in the dirt patch already! Re-exploring the paddock. 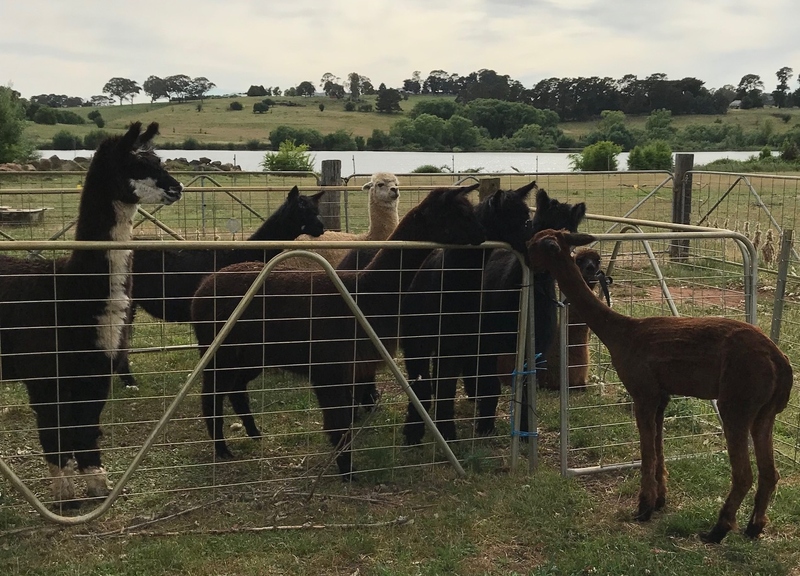 We often get asked for tips for small holders of alpacas for shearing time. 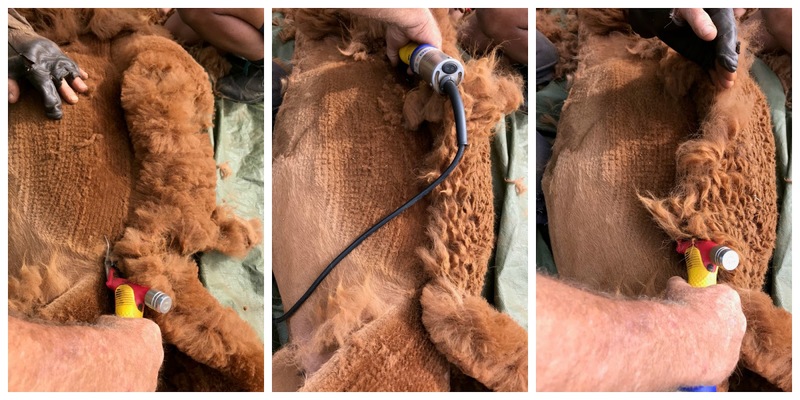 Whilst the shearing process is the same for large breeders and small alike, not all small breeders or owners have nice shearing set-ups or the experience so shearing time can be quite stressful. Here are a few of our tips to make it easier! What do we do with the neck and leg fleece? 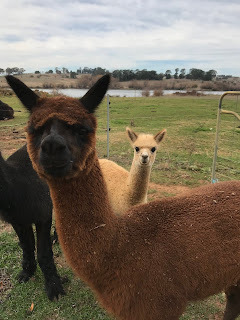 Unless you have a top breeding alpaca, generally the the neck and leg fleece is too short and hairy for processing however it makes wonderful fertiliser for your veggie patch! Very exciting! We have just launched our first call for design submissions! 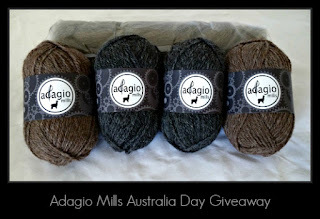 Do you have an idea for a knit or crochet design that would showcase the Adagio Mills yarns? 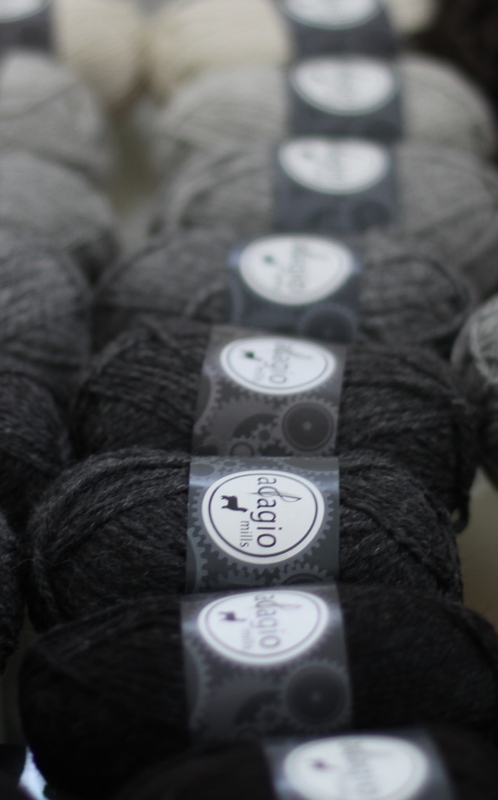 Adagio Mills is looking for independent knit and crochet designers who would like to work with us to develop patterns for our yarns. We have some very exciting opportunities for launching patterns coming up, including a fashion show and we would love to share the experience with a few indie designers. 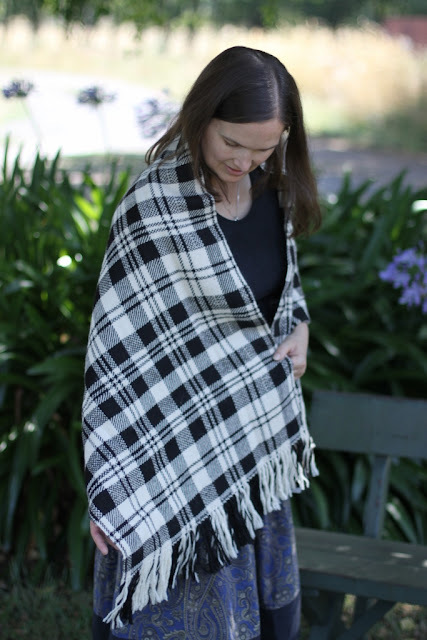 We are very proud of the yarns we have been making and we had a wonderful moment this week that I just had to share with you. Starting a new business is tough but its the kind and thoughtful words or actions of the people around us that keeps us going. We have been working on a few projects with Marie and Fred Lawson of the Crofter's Weaving Mill and their kind words and encouragement have often come at points of time that we really needed it. Last week I arrived into the office to find the most wonderful package waiting for me. Marie had sent a beautiful shawl that they have made out of Adagio Mills 4ply yarns. They are loaning it us as a display piece. It is simply stunning. I was moved beyond words. 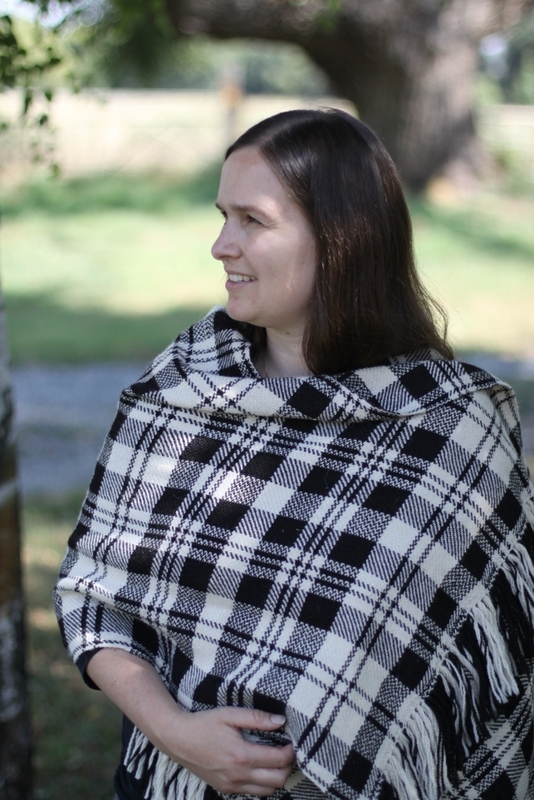 The shawl is woven using using the SIR WALTER SCOTT Tartan design using Adagio Mills natural black and white alpaca yarn. The result is amazing. Andrew has taken these lovely photos in our garden. We had to hunt around a bit for some nice green grass! Everything is a bit dry and crunchy here at the moment. We had a little rain this last week but like many others are very much hoping for some more soon! Marie and Fred are very talented and have the license to weave and design tartan in Australia. If you would like to contact them about their weaving services, please contact us and we will pass on their contact details. I can't believe it, through colds, snow, flooded roads, visitors and generally normal life we have created the Adagio Mills Rainbow Beanie pattern and project kit! It even has multiple sizes! Hmmm its a little later than I'd planned here... So only a quick hi here to share my excitement! I'm not usually comfortable with photos of me, nevertheless here I am! Today was a gorgeous foggy day. The kind where the fog is comforting and lifts all the colours whilst cloaking them in cloud. Perfect day for some craft. Fridays are precious in our household. After the madness of trying to fit as much work in the hours available earlier in the week and James at preschool, Fridays are my day with the boys where we have no commitments. Often there are the pile up of shopping, washing and other household chores but some days like today we ignore them all and we aim to have a quiet day doing preschooler things. As much as they are our dedicated day together, fridays can also often be tricky balancing work calls and James settling back into playing at home after all the entertainment of his preschool friends. So as much as I loved the beauty of the foggy day we definitely needed some planned craft today! With all my test knitting and crochet, James has become inquisitive and has wanted to do something with the yarns himself. 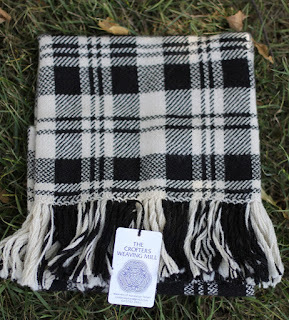 After reading around various other blogs I have had a weaving project in mind for him for just such a rainy day event! As I suspected he was a little young yet to really get into it and the project was a little too big for him to finish but both boys thoroughly enjoyed the activity! Even Xavie did quite well with his weaving with a little help. After a few rows, and a good half an hour, James put his aside but he'll be back again I'm sure another day. Things have been the typical brand of chaos trying to keep everything running and improving at the mill and expand our network. We have been doing lots of travelling to markets to talk to as many people as possible and spread the word that we exist. The most wonderful thing is everywhere we go people find us to show what they have made or introduce themselves as one of our kickstarter backers. We are putting so much energy into making every single yarn that it is so uplifting to meet everyone and see what they have been inspired to make. Reminds us of why we are doing this on the tough days. We have also been doing some pattern design experiments in the background. My current project started with some scraps of ends of runs of yarns and Xavie needing a beanie. He just love love loves hats. So when James started wearing his beanie, Xavie wanted one as well and started wearing mine! It was so cute, just kept falling over his eyes but he stubbornly insisted on wearing it! Everyone loves the sample tension strip of colours I have as a display piece and comment on how they'd like to have our rainbow. These various brainstorm ideas collided a few weeks ago and became a prototype Adagio Mills Rainbow Sampler beanie. A few friends and I are currently madly test knitting the various sizes and the mill is completing the missing colours we need for it in the hope that we will be able to release it as a project pack very very soon. Xavie is somewhat perplexed that I was knitting another beanie just like his today! He was just the happiest kid ever when I finished his beanie and he got to wear it in the cold last weekend just like the other bigger kids we had visiting for the weekend. He is so attached with it that during the day he always knows where it is and often includes it in his games as you can see it has been carted around with his blocks in his favourite truck today. I don't have as much time as I would like to share crafts with my boys but crafts with my Mum forms many of my treasured memories as a child and I love to share them with my boys. What crafts are your favourites to share with your children? 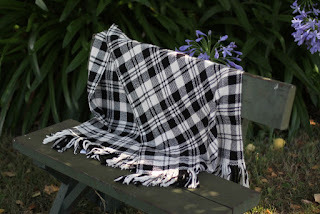 blanket on our front lawn! 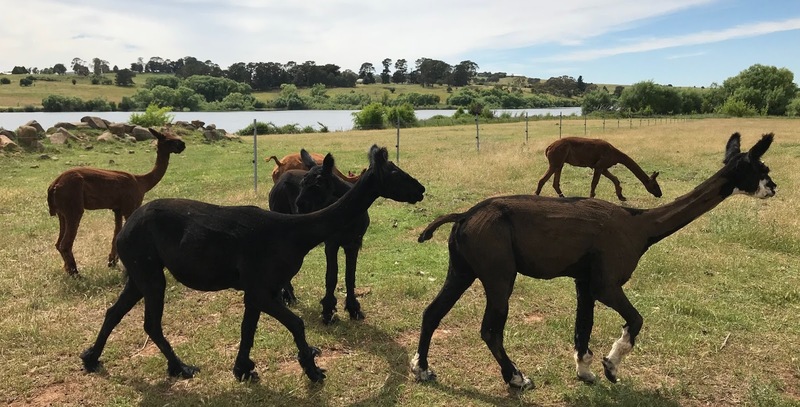 Looking out into a paddock of alpacas and seeing the range of beautiful colours grazing to their hearts' content is something really special to behold. 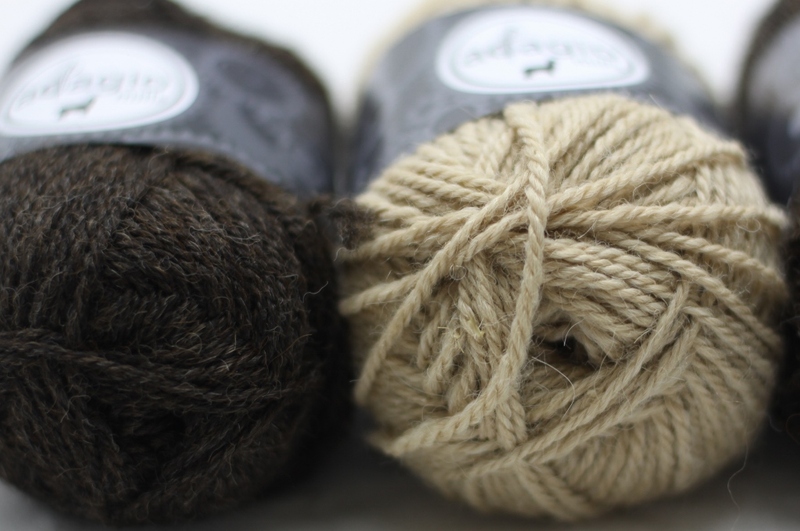 I have been trying to think of a way to share our love of the natural alpaca colours, they way they coordinate so beautifully together and hence also our vision for Adagio Mills yarns. The best way I have come up with so far is to start working on a project that has always been waiting to be made in the back of my mind for many years. As a child my mother had a granny square crochet blanket. One of the classic retro ones with the rainbow colours and black edging. I'm not even sure if she made it or one of her relatives (I really should ask!) but it was something that I loved to snuggle in. I have made a few false starts over the years but have now found the inspiration to start one in ernest. So the two ideas have collided and I've made a start on my granny square blanket. 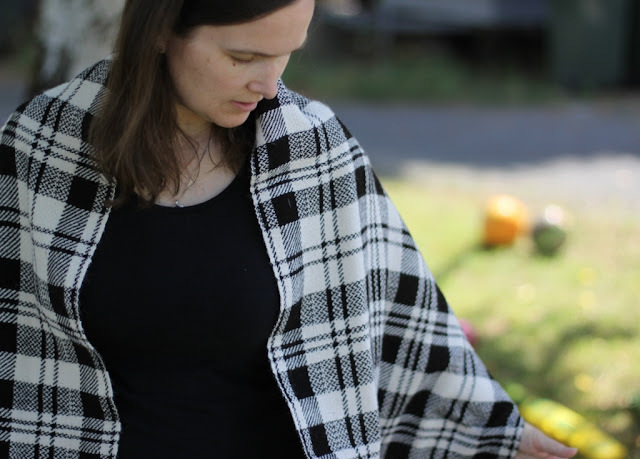 It's really rather perfect timing for this blanket, until we are really up and running, I can only really justify working with the scraps left over from Adagio Mills yarns and that is exactly what this project needs! It will also be a fantastic keepsake record of our first yarns. My "paddock of alpacas" granny square blanket is already loved in our household. As soon as I pull the project bag out my two boys instantly drop what they are doing and run over to claim a square or two. I think I'm going to find a stack of them at the bottom of the toy boxes once the project has been finished! They rub the squares on their faces and run around with them with all the ends flying in the air. My eldest has already announced that its going on his bed. Well... we will see. Some of the yarns and squares currently in progress. Yes, some of the greys almost look blue when combined with the other colours! I love adding new yarns to our shop and Adagio Mills Weathered Wood and Latte will not disappoint! 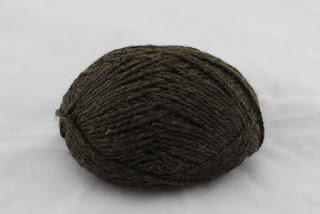 What colour is this yarn? We have had such fun naming Adagio Mills Weathered Wood. Boring engineer me initially named it Black Fawn... (made sense to me!! black fibre and fawn fibre.. black fawn. easy!) 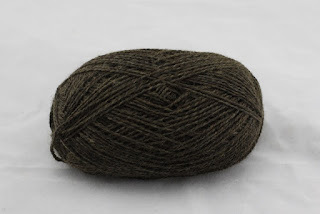 However a family member pointed out that the yarn really wasn't black so that would be confusing. So that got us talking... We kept saying maybe its "grey" or "rose grey" or "bay black" or "brown" but each time we put it near a similar shade of the colour in question it wasn't that at all! 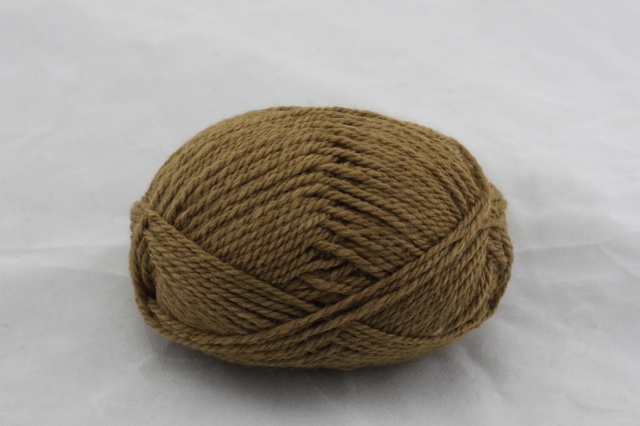 We put the adjacent photo up on Instagram and Facebook to see if anyone could help us name this yarn appropriately! (yarn in question is at the base of the photo and middle of the top section with black, grey, rosegrey and brown clockwise from left) We had so many wonderful suggestions including tweed and tortoiseshell but eventually settled on weathered wood. Adagio Mills Weathered Wood on my front door step! Its also show to the right up against the railway sleepers that are my front doorstep! Just blends into our doorstep perfectly. We have also added a brown and fawn blend that we have called latte. It is just so soft and yummy! I can't wait to see what everyone will make from these yarns! Congratulations to Catherine of Jarrahdale who was the winner of our giveaway. Thank you to everyone who entered! Wow what a journey the past few months have been. We are so proud to be launching a 100% Australian manufacturing business that supports Australian farming and employment. Starting up a business takes guts, determination, a lot of stubbornness and the willingness to take a risk. I think if anyone else tells me that we are "brave" I'll have a not so quiet meltdown in the corner! In any case, Adagio Mills is still very much in its infancy however we are very excited that this will be our very first Australia Day. So in celebration we have decided to do a giveaway competition. To enter visit this link and it would be awesome if you could spread the word! If you are looking for ways to support Australian manufacturing, farming and employment, look for businesses like us in your everyday life. Sometimes we are hard to find, but are often found more easily than first anticipated. We ourselves are spotting more and more fantastic Australian initiatives and try to support them wherever possible. Support 100% Australian manufacturing this Australia Day. I also managed to finish another knitting project today (shock, horror, I know! I surprised even myself with finishing another project so soon!). 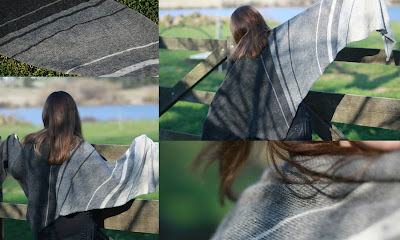 Its another Milo, pattern by tiKKi here and my project details on ravelry here. I just love this pattern. I really enjoy knitting the cable and it is such a comfy vest for children to wear. When James was 2 years old, his milo vest was the only jumper he would willingly wear! Our adventures living on our 9 acres with our boys growing veges, caring for our, alpacas, golden retrievers, steers and chickens. 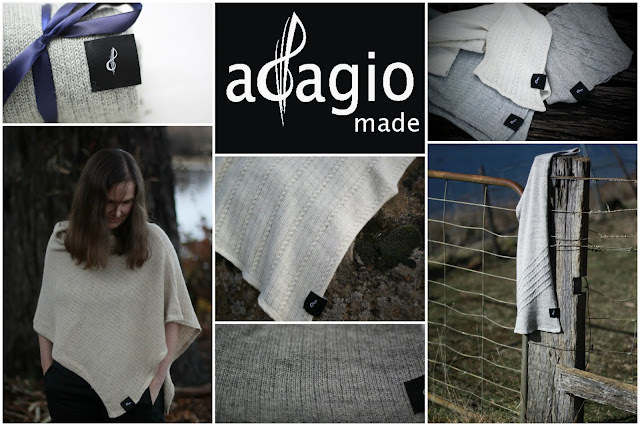 We are also embarking on a new business, Adagio Alpaca Mills. I'm always hopeful that I'll fit some knitting, patchwork and quilting in as well! Adagio - Our farm - Come on a tour! Copyright adagio alpacas. Simple theme. Powered by Blogger.